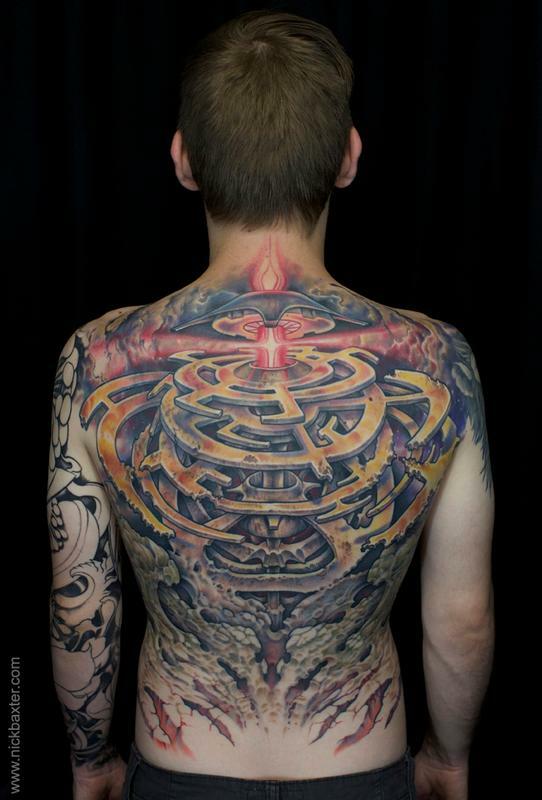 When my good friend and fellow tattooer James Hall gave me the concept of "time and space" to run wild with for a full backpiece, I wanted to create something that felt as huge and epic as that concept can be. Something showing the ancient and still unfolding process of creation; something that represented the abstract concept of time through a visual symbol. To accomplish this I chose gears to represent time, powered by a flash of perhpas divine light energy from the cosmos, transferring that energy into the forming of worlds. I drew heavy inspiration from the intriguing concepts explained by Graham Hancock from the book "Hamlet's Mill", which pieces together ancient human mythologies and argues that they are all encoded with astrological measurements and calendrical significance related to the precession of the equinoxes (i.e. our planet's unique tilt, wobble, and movement through time and space), in order to pass this information on to future civilizations.